Hello friends! Hope you all had a great weekend! We just returned home from Myrtle Beach, we spent the past week relaxing by the pool and at the beach playing in the sand. We also ate out every night, it was great! I didn't even have to cook :) I had such a great time with my family, it was really hard coming back. While we were driving the twelve hours home from Myrtle Beach, I had the idea of sharing my experience as a work at home mom and what has been working lately for me and what hasn't. Being a work at home mom is certainly a work in progress and I know I have plenty to learn. If you have any great tips to share, I would love to hear from you! I honestly never dreamed that I would be a Stay At Home Mom. In fact, just the opposite. After college, I was as a Corporate Accountant and your typical career-oriented girl who prided herself on hard work. Before we had kids, I was always one of the last people in my office to leave for the day. Then I had my daughter Jillian and life as I knew it completely changed. I returned to work after maternity leave and it was one of the hardest things I ever had to do. The first month back was a complete adjustment period, but even after a month I was still really struggling. I cried every morning when Jillian left for daycare and I couldn’t focus on my job at all. I’d sit in meetings, look at the people around me, but not really see them. I would just think about how the things that were important to me before I left for maternity leave were so insignificant to me now. Nothing was as important as being with my little girl. Eventually I stuck it out and got into a new routine and tried to embrace our new normal. After two very long years as a working mom, I gave birth to my son Nicholas and made the decision once and for all to leave my career. There was no way I could leave both of my babies. It was the best decision of my life. I was introduced to Direct Sales when I wasn't even looking for a new career. I decided to take a leap of faith and signed up as a sales consultant. A few days later, I found out I was pregnant with my son. During my pregnancy, I continued to work both my full time job and build my business with the ultimate goal of me eventually leaving my full time job to stay home. And I accomplished just that! Jillian is now 3 and Nicholas is 1 and I am running a successful business from home. How did I do it? With a lot of courage, hard work and the support of my husband, I am living my dreams every day. I am certainly no expert on working from home but I hope to share with you what has worked for me and has not. When it comes to being a work at home mommy, my first priority is always my kids. I do struggle a lot with trying to give my kids individualized attention while also providing excellent customer service and leadership to my hostesses, customers and my team. I am always looking for new ways to continuously improve my current methods and try to quickly remedy what isn't working. I do try to make most of my calls when Nicholas is napping and not clinging to my leg. Jillian is a little better than her brother when I get on the phone and I always make sure she is being entertained by a TV Show or iPad before picking up the phone. 7pm Wake up as Jeff is getting ready to leave for work. I make myself a cup of coffee, grab a Nutri-grain bar, and head to my office. First, I review my to-do list and prioritize the 5 most important things that I would like to accomplish that day. I write them down on the white board in our kitchen command center so I can look at it throughout the day. I then respond to emails and Facebook messages. If the kids are still asleep, I start trying to accomplish my top 5 to-do list items focusing on the ones that are easiest to accomplish without the kids around. While the kids are eating I turn on Disney Junior and start planning out the rest of my day. 9am - 10:00am I take the kids upstairs to get them and myself dressed. We stay upstairs a bit while the kids play in their rooms and I put away a basket of laundry. 10:00am - 11:30am We head back downstairs to play a bit more. I try to squeeze in a phone call and answer a few quick emails. I write up a quick post on my Facebook fan page and check my team message boards for any updates. 11:30am - 1:30pm I give Nicholas a bottle and he goes down for a nap. Jillian plays a bit in the toy room or Disney Junior games on the computer. I squeeze in another phone call and email before I start making lunch. 1:30pm - 2pm Nicholas wakes up from his nap and I give him the left over lunch I made for Jillian and I. 2pm - 4pm Jillian seems tired but not enough to go down for a nap so I decide its a good day for me to drive around town to drop off a few customer orders and a party that I had bagged up the night before. Sure enough, Jillian passes out in the car and takes a nap. Product drop offs are great for nap time, I run out of my car and leave the order on the front porch or with my customer and jump right back in the car. I also use drop off time to return a few phone calls while the kids are sleeping in the car. Multi-tasking at its best! Jillian wakes up after I have completed my drop offs so I decide to stop by the grocery store to pick up a few things for dinner. 4pm-5:30pm After we arrive home the kids and I will read a few books and play a bit more. At 5pm I give Nicholas a bottle and then prepare our dinner. The kids play in the toy room while I continue to cook dinner. I squeeze in another phone call and check Facebook to see if I missed any important updates on my team message boards. I answer a few questions that my team has asked me and then return to making dinner. 6pm-7pm Jeff arrives home from work and we all sit down for dinner together. 7pm-8:30pm Jeff plays with the kids while I call one of my hostesses to close out her party. After a 30 call with my hostess, we decide to get out of the house for a quick walk around the neighborhood. 8:30pm - 9:30pm Time to give the kids a bath and get them ready for bed. Jeff will take Jillian and put her to sleep while I give Nicholas his bedtime bottle and put him down. 10pm - 11pm I unwind from my day and hang out with Jeff on the couch. Some evenings I spend this entire time with Jeff on the couch watching TV. Other nights I use this time to work in the same room with Jeff so we can still hang out or I will head to office to work for an hour. I always try to get to bed by 11pm with Jeff. I try not to let work interfere with the rare hour in the evening that Jeff and I get to ourselves. This is why it's key that I get up in the morning before the kids are up. 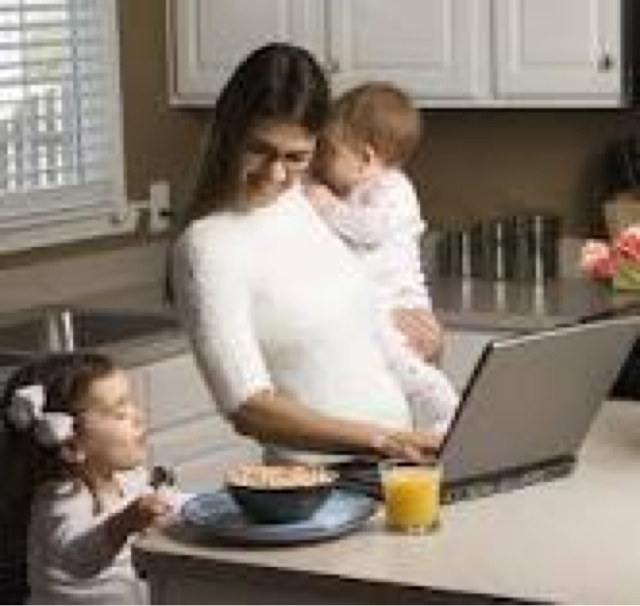 Problem with that is I am not a morning person at all but being a work at home mom is helping me to be. Those rare morning hours when the kids are still asleep are precious to work at home moms! 1. Staying up Late. I am a night owl and more productive at night, however, being a night owl only works for those who can sleep in the next day. I do not do well on less than 8 hours of sleep and make myself go to bed at 11pm. I could easily stay up until at least midnight but I have two small alarm clocks that will not allow me to sleep past 8am. I have found too that if I work too long before bed, I have a hard time turning my brain off. I am not able to fall asleep right away and I toss and turn thinking about what else I need to do. Before I know it, I have wasted a good hour of precious sleep thinking about my businesses. I also don't like going to bed after Jeff and sacrificing that quality time laying in bed watching the evening news. 2. Trying to accomplish tasks that really should be saved for child free times. Calling a customer right before lunch time or going through an order while both kids are awake only results in errors and a bad experience for my customers. This also takes away from quality time I can spend with my kids or deviates from their schedule, which isn't good for any body. 3. Scheduling too many parties in a month. Although I would love to have as many appointments as possible a month, my young family does not do well when I schedule more appointments than I can handle. This averages to about one a week. I have learned to say 'No' and push appointments into the next month if I have to. I absolutely hate saying no, I am too much of a people pleaser but I have learned the hard way. Scheduling more than four appointments a month and my family suffers. Jeff is supportive but even he has limits! 1. Getting up before the kids. Right now I get up an hour before them, ultimately I would love to turn this into two hours. In reality, any time you can work while the kids are asleep is going to be the most productive. 2. Product drop offs during afternoon nap time. I only do product drop offs this 1-2 times a week and afternoon nap time is a great time to do this. Usually one of my babies if not both will fall asleep during this time. It's a great time to get my drop offs accomplished, I am working but they are also napping. Win-win! 3. Voicemail! I screen the majority of my business calls unless I know the exact reason for the call. This way I can make the judgement call if this is something I need to address it right away or if it can wait until nap time or product drop off time. Usually I can respond quickly through a text or email. If its something that needs addressed immediately, I return the call right away and pray the kids don't act up. 4. Have an organized home office. I always try to work with a clean and organized home office. I am the type of worker that needs a clean desk to be productive. If my desk is cluttered, my mind feels cluttered too. It's also helpful to have your hostess kits and recruiting packets pre-made. That way if you need to put one in the mail, it takes all of five minutes to grab one, address the envelope, and walk out to the mailbox all while both kids are awake. 5. Kitchen Command Center. I bought this Kitchen Command Center from Kohl's a few months ago and I can not even begin to explain how this one product has helped get us organized. Each member of the family is assigned a different dry erase marker. Everyone knows appointments in red are Mommy's Home Parties. Jeff checks the calendar each morning and can see what we have going on for the day and if he needs to be home on time so I can head out to a party. Another key feature to my Kitchen Command Center is the dry erase board to the right of the calendar. This is wear I jot down the top 5 things I want to accomplish in my day and I scratch them off as they are completed. I am totally a list girl and love to see those items marked off my to-do list! 6. Help. I am very blessed that my Mother-In-Law comes over on Mondays and watches the kids for a few hours so I can get some work done. This is where I try to get all of my weekly tasks done that I have saved up that I haven't been able to scratch off the to-do list. I also will use this time to run a few errands like grocery shopping, the post office, Kinkos and product returns at the UPS store. Jeff has also been a huge help in watching the kids when I need to call a potential recruit or a hostess to close out her party. I try not to enlist Jeff's help too often because I don't want too many business tasks to interfere with family time. 7. Amazon.com. This one may sound a bit surprising but trust me here. We purchase the Amazon Prime each year for free and expedited shipping and it is worth it's wait in gold! Amazon sells every office product imaginable and cheap! If I run out of printer toner or Avery Labels, I can place an order on Amazon.com and have it the next day. It's fantastic! One less errand I have to drag both kids out to the store. I also have a file folder that I keep all of my Amazon.com receipts them which makes it easy during tax time. 8. Minimize Distractions. It's so easy to get lost in Facebook and other social media throughout the day. I find myself checking my Team Facebook groups and before I know it a half hour of rare, childfree time has gone by and I have scratched nothing off my to-do list. Try not to get sucked into the Facebook black hole, especially during those precious hours when your kids are asleep. If you need to post something important, focus on the task at hand an then completely log off. Don't jump to your news feed that is full of mindless distractions. 9. Have Realistic Expectations. I try to accomplish those top 5 to-do items at some point during the day, however, life happens and your day gets completely away from you. Before you know it, your day has passed an its already time to make dinner. Don't let your untouched to-do list cause you unnecessary stress. Your primary goal is your kids, to make sure they are well rested, fed on time, and given the attention they deserve. After all, isn't that why you wanted to stay at home in the first place? Great blog! I am now following you. Can you return the favor?